That unsubstantiated claim is essential for their following proofs on “The Search for a Search”! I tried to solve this conundrum, but I came up with I = 7.8 bits. I contacted the authors, but got no reply. I gave it a generous two stars. By chance, I looked up my link to my comment today, but I could not find my review – though it was up there for at least a couple of months. Does anyone know what has happened? Surely, The Three Doctores would not steep so low to eliminate unwanted critique! Search is a central term in the work of Dr. Dr. William Dembski jr, Dr. Winston Ewert, and Dr. Robert Marks II (DEM): it appears in the title of a couple of papers written by at least two of the authors, and it is mentioned hundreds of times in their textbook “Introduction to Evolutionary Informatics“. Strangely – and in difference from the other central term information, it is not defined in this textbook, and neither is search problem or search algorithm. Luckily, dozens of examples of searches are given. I took a closer look to find out what DEM see as the search problem in the “Introduction to Evolutionary Informatics” and how their model differs from those used by other mathematicians and scientists. Yesterday, I looked again through “Introduction to Evolutionary Informatics”, when I spotted the Cracker Barrel puzzle in section 5.4.1.2 Endogenous information of the Cracker Barrel puzzle (p. 128). 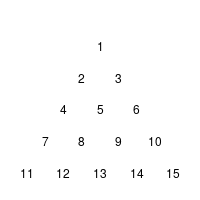 The rules of this variant of a triangular peg-solitaire are described in the text (or can be found at wikipedia’s article on the subject).